When working as a freelancer, it is important to create your own brand and to define a strategy on how you want the world to perceive you and your work. In this digital age, the best and easiest way to do this is through social media. By using social channels, you can not only strengthen the relationship you already have with clients but also win more of them. The main thing to do when starting out on social media is to define which channels you want to prioritize, what kind of message you want to send to your public and what goals you have in mind. Apart from knowing what you do, you also need to keep in mind what not to do, like ignore comments and messages that come through these channels, for example. 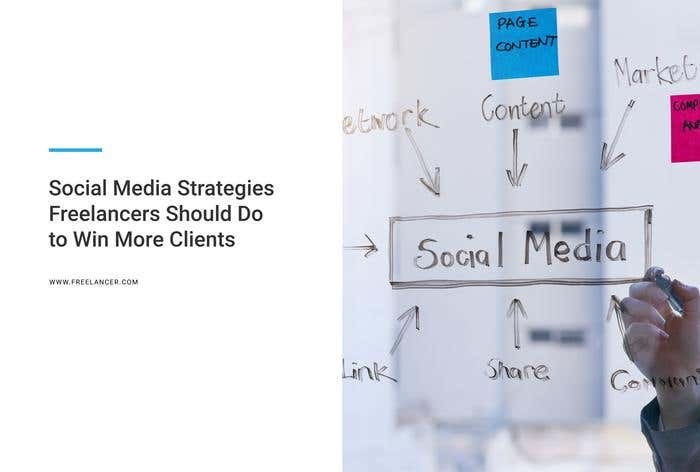 Below you can find social media strategies freelancers should do to win more clients. The first thing to think about when deciding to use social media for your freelance business is to find potential clients in your niche. Where are your customers? Are they on Facebook? Do they use Twitter regularly or are they more inclined to browse Instagram? Defining which channels you want to be a part of is crucial for your success. Think about what you are trying to sell and also which social media platform is more beneficial for your business. Once you have decided in which channels you will be present, it is time to think what you want to accomplish by being on them. You don’t have to stick to only one goal — use social media to attract more clients and also to interact with your community — but it is important to have them outlined to develop a strategy on how to achieve them. Now that you have set your goals, it is time to think about how you will attain them. Depending on which channels you showcase your work, you will have different options on how to advertise your posts and reach as many people as possible. With Facebook Ads, for example, you can target a certain age group and location. It is imperative that you present yourself and your work professionally in your social media channels. Be extra careful with what you post. Make the copy engaging and the images visually attractive. Don’t forget to proofread your text. Remember that you are trying to get potential clients to notice your work, so avoid spelling mistakes at all costs. A good tool you can use to help you with this is Grammarly. Remember to stay active and keep your channels updated. Don’t forget to respond to messages that your followers send you and try to interact with them as much as possible — be it by liking one of their comments or retweeting an interesting tweet. These are all tips you can start implementing today by yourself. However, if you would like to have some tailored solutions specifically for your business, why not post a project ask help from fellow freelancers who are social media experts? They can help you find the right voice and tone for your channels and help your online community and your business grow. Hi there! My name is Renata and I work on Recruiter projects at Freelancer.com. If there is anything I can help you with, please let me know. I'm here to support employers and freelancers from start to finish in anyway I can. I'm excited to have you as part of the community and look forward to working with you.